What purpose does cartilage serve? The cartilage in the knee provides shock absorption and reduces the forces transmitted to the bone. Intact cartilage is also very smooth, which enables the surfaces of the joint to glide across one another with minimal friction, facilitating flexible movement of the knee. Cartilage injury may be caused by a sudden trauma (accident), repeated micro trauma (strain) or degeneration (wear and tear). Typical complaints involve pain when strain is put on the knee and crepitations, a grating sensation in the knee. Often there is also intermittent, reactive swelling. The knee may also feel unstable. If the loose fragment of cartilage floats around the knee joint it could cause blockages. The diagnosis of a focal cartilage injury is confirmed by means of an NMR scan or CT arthrogram. Treatment of acute cartilage injury depends on the patient’s age, the extent and location of the injury. In many cases, conservative treatment with medication, injections and/or a brace, can offer relief. Different surgical procedures exist to repair cartilage injuries (microfracture, cartilage transplant, AMIC, OATS and mosaicplasty etc.). The decision to perform a certain procedure mainly depends on the type of injury. See also cartilage repair for more details about the various procedures. In the case of long-term strain (heavy load, overweight, axial misalignment) the quality of the cartilage as a whole will decrease and thin more quickly. The quality of the cartilage also decreases as we get older and wear and tear is more likely to occur, as is osteoarthritis. These defects can often be observed on an X-ray taken of the patient standing up. General cartilage thinning cannot be treated with keyhole surgery. In this case non-surgical treatment is preferred, including adjustment of the activity, muscle strengthening and weight reduction, if necessary. In more pronounced cases it may be decided to reduce the load on the thinned cartilage by performing an osteotomy. There are various techniques for treating cartilage injuries. 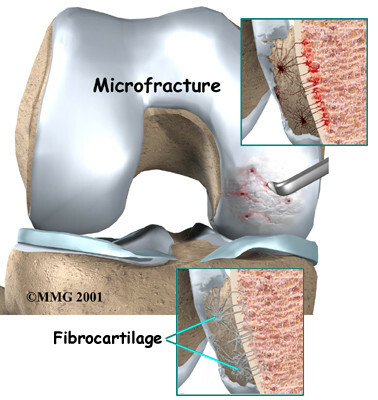 The most common are microfracture, a cartilage cell transplant (Autologous chondrocyte implantation, ACI, MACI), mosaicplasty, AMIC (autologous matrix-induced chondrogenesis), OATS (Osteochondral autologous transplantation system) and cartilage scaffolds (MaioRegen, GelrinC). In addition, new techniques are constantly being developed, a number of which are currently only available as part of a study. Discuss them with your doctor. The most effective technique is selected depending on the type, location and extent of the cartilage injury. The operation can be performed via keyhole surgery but there are occasions when the procedure is performed via a traditional incision. And in one or two operations. The operation does not require an intensive recovery period, but it is relatively long. The new cartilage needs time to grow so weight may only be put on the knee very gradually. A specific physiotherapy programme is provided when the patient is discharged from hospital. A brace is worn during the first couple of months of the recovery period. The operation is performed in the outpatient clinic or with brief hospitalisation (one night).